The Walters Art Gallery, in partnership with the Maryland Film Festival, presented three short films from the Enoch Pratt Free Library's 16mm film archives as part of its "New Sounds for Silent Films" live music program. In conjunction with the museum's special exhibition "A Feast for the Senses," musicians Jamal Moore, Ami Dang, and WUME created and performed new scores for the three "silent" films (actually, though mostly lacking spoken word, they all originally featured musical soundtracks or sound effects). Regardless, the event organizers couldn't have picked three better "trippy" films to stimulate the senses. 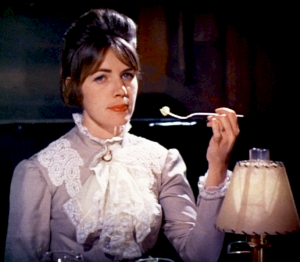 Films included: Moon 1969, Asparagus, and Time Piece. The screening was free for Walters Art Gallery and and Maryland Film Festival members. This is the film Scott Bartlett made with Michael Hollingshead, the guy who turned Timothy Leary (among others) on to acid with his infamous mayonnaise jar filled with 5,000 hits of pure Sandoz LSD. 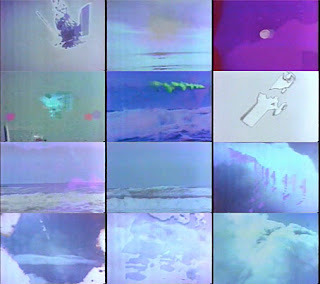 In it, blurred television tapes of the Apollo 11 moon trip, alternating explosions of blank and color film, music, the voice of an astrologer discussing "all-ness," love, and the stars, and abstract film patterns combine to create what the director describes as a "cosmic mind flight" and "a space-age sermon celebrating the joys of metaphysical love." In his study of 1960s American experimental cinema The Exploding Eye, Wheeler Winston Dixon wrote "[Scott Bartlett's films] exemplified San Francisco's preferred form of cinematic discourse for a later generation of artists, poets, writers and videomakers...The visual structures of Bartlett's films influenced the images we see on MTV today, as well as the digital special effects employed in many contemporary feature films." According to Paul Brawley of the American Library Association, "The interrelated convolutions and spasms of image, color, and sound that filmmaker Bartlett creates is the cumulative effect of his pioneer work using negative images, polarization, television techniques, computer-film, and electronic patterns all compressed into a visual punch that directs one where he normally would not go with a film - on a trip in search of the human soul." Gene Youngblood of the Los Angeles Times adds, "Moon 1969 is a beautiful, eerie, haunting film, all the more wonderful for the fact we do not once see the moon: only the manifestation of its powers here on earth, the ebb and flow of the waters.. fiery rainbows into a cloudy sky... men and rockets transformed into shattering crystals... creating a picture if the cosmos in continual transformation." Check this title in the Enoch Pratt catalog. Suzan Pitt - Asparagus (1978).avi from anastasios on Vimeo. This "candy colored animated nightmare" rocked audiences upon its release - it ran theatrically with David Lynch's Eraserhead on the Midnight Movie Circuit - and catapulted Suzan Pitt to the front ranks of indie animation. 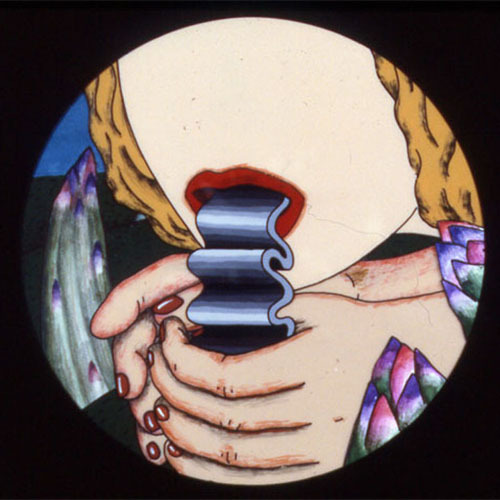 From its opening scene of a woman defecating an asparagus spear into her toilet bowl to the concluding set piece (also very Lynchian and reminiscent of the theater scene in Muholland Drive) in which the artist opens her Medusa's box to release rare wonders before a claymation audience, stunning cel animation propels its blank-faced protagonist into a world of Freudian symbolism and Jungian archetypes. Winner of the grand prize at the Oberhausen Short Film Festival. Suzan Pitt later worked on some Peter Gabriel music videos. 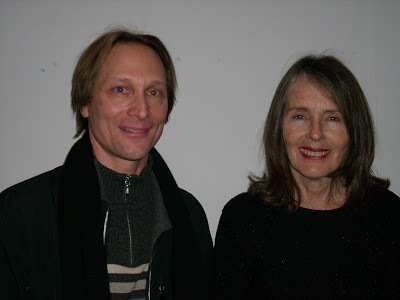 On February 15, 2008, she made a Baltimore "Pitt" stop to present a special screening of Asparagus (on 35mm!) and other works at the Maryland Institute, College of Art. 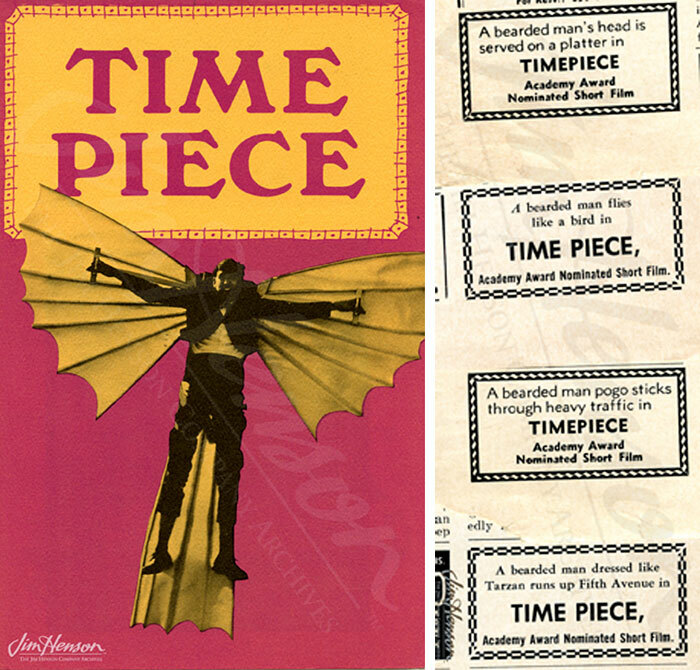 Time Piece is a 1965 experimental short film directed, written, produced by and starring Jim Henson (credited as "The Man"). The film depicts an ordinary man moving in constant motion, in a desperate attempt to escape the passage of time. It is noteworthy for being a non-puppet, live-action Jim Henson production. 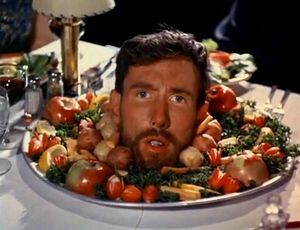 Watch a short clip from Jim Henson's Time Piece. 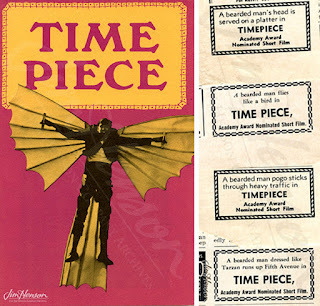 Time Piece received several film festival awards, including the Blue Ribbon Award from the American Film festival in 1967, and was nominated for an Academy Award in the "Best Short Subject, Live Action Subjects" category in 1966. In 2008, it became available at the iTunes store. Henson began the project in the spring of 1964 (initially titling it Time to Go) and continued to work on it for nearly a year, between commercial projects and various Muppet television appearances. The short film premiered on May 6, 1965 at the Museum of Modern Art and was distributed through Pathe Contemporary films to arthouse theaters and the film festival circuit. 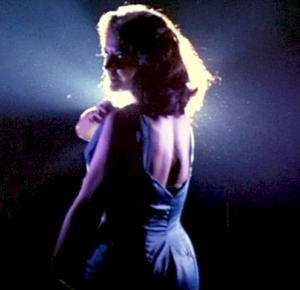 It played in New York City along with the French feature A Man and a Woman. The surrealist film, which runs slightly less than 9 minutes, follows a nameless man who lies in a hospital bed awaiting examination by a doctor through a wide range of experiences. Mundane daily activities are intercut with surreal fantasy and pop-culture references. The relentless passage of time is a recurring motif, both visually, through various clocks, and aurally, through a rhythmic percussion soundtrack which "ticks away" throughout. Key set pieces include an examination of workplace drudgery, a prolonged dinner sequence (intended as a spoof of a scene from the film Tom Jones), and a nightclub visit satirizing the striptease (including a dancing roast chicken and a marionette skeleton). The man also rides a pogo stick, shoots the Mona Lisa, escapes from prison, and gradually applies a coat of pink paint to a living elephant. He assumes different costumes and identities throughout, from Tarzan to a cowboy, and repeatedly utters the only dialogue in the film, a plaintive cry of "Help!" from increasingly incongruous and perilous positions. Apart from the rapid montage cutting and superimposition of objects, Jim Henson used animation heavily to create an impressionistic feel. He personally animated scenes of moving patterns, anticipating those later utilized in various Sesame Street inserts. Don Sahlin supervised the use of pixilation and reverse motion to further "stylize" the movements. Enid Cafritz as Jim Henson's wife in "Time Piece"
April March, "First Lady of Burlesque"
April March in "Time Piece"
...Broadway dancer Barbara Richman, and drummer Dave Bailey. Most of us get jittery when we hear about creating essays or some dissertation even assignments. Essay writing is exasperation, and tiring occupation. You have to set your total focus to jot down the info about the topic you have selected to write about. 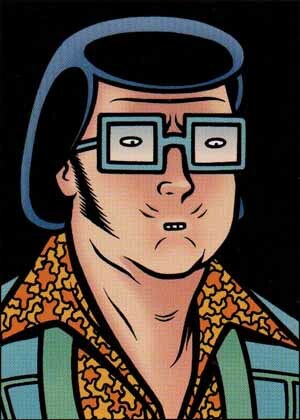 Talking about custom research papers and writing about that 1 matter gets to be monotonous if the essay is lengthy. But irrespective of the size of the essay you have to write it in this kind of a way that each sentences and paragraph ought to make feeling and be informational. But essay creating can be simple and comforting also if you adhere to a set of rule. Download one of the other apps for doodling memos, etc, and it's just about perfect IMO.